Diamond consumers, especially millennials, expect more from their diamond retailer than just the piece of diamond jewellery. They want to be assured that the diamond they are purchasing does not support any conflict, terror or illicit activities. Furthermore, they are keen to know about the pathway of that diamond from being the diamond rough out of the mine to the piece of jewellery in the shop. The diamond industry in recent years has been responding to these needs in different ways and the process continues to evolve. The earliest need for the industry to trace the pathway of the diamond from mine to market came in 2011 when the United Nations Kimberley Process approved the sale of diamonds coming out of the controversial Marange fields of Zimbabwe. These diamonds were banned by the United States (and they continue to remain banned today). Hence, manufacturers who wished to supply to the United States needed to distinguish which diamonds came out of the Marange fields versus the rest of the world. At that time there was considerable debate as to how this could be done because the norm was to separate diamonds based on size and quality as opposed to source. wanting assurances that their diamond has been ethically sourced. Furthermore, it is highly valued if retailers are able to showcase the path of the diamond from the mine through to the finished piece of jewellery. In my experience, this has become “the norm” ofcustomer expectation with almost all of my customers asking me – “where do yourdiamonds come from”? In recent years, consumers especially millennials, have raised the bar by wanting assurances that their diamond has been ethically sourced. Furthermore, it is highly valued if retailers are able to showcase the path of the diamond from the mine through to the finished piece of jewellery. In my experience, this has become the norm of customer expectation with almost all of my customers asking me –“where do your diamonds come from”? This is not to say that those retailers who satisfy these consumer expectations can sell their diamonds at a premium. It is the new ‘normal’ – demonstrate that your diamonds do not support conflict; and use new adaptive technology to tell the story of mine to market. • the Ekati and Diavik mines in the remote North West Territories of Canada: these mines are located about 200km south of the Arctic Circle and have an amazing story of being environmentally friendly in their mining processes and providing employment to local indigenous communities, in spite of being in such a challenging remote and extreme weather location. • the Argyle mine in the remote Kimberley region of Western Australia: known to produce some of the most intense and rarest coloured diamonds such as pink, red, orange, blue, yellow, champagne and cognac. However, as is the case with natural resources, these mines have a limited life span and will not be around for too long. The diamond industry has started responding to consumer demands of tracing the pathway of a diamond from mine to market. But challenges remain. Two of the world’s largest miners, De Beers and Alrosa have combined to develop an end-to-end blockchain traceability platform to provide assurances to manufacturers and consumers about the origin of their diamonds. This technology records the data flow associated with the diamond from mine through market. There are some who question blockchain technology because recording the data has no physical link to the actual diamond rough. Hence, some use laser technology to track the physical diamond rough through to the polished stone. The laser testing technique focuses a laser beam to create a laser inscription in a diamond. This removes a sample of atoms and molecules from the surface of the diamond and transforms them into a plasma. The cooling plasma then emits light on different part of the spectrum allowing one to analyse and determine the structure and composition of the diamond. This is the first time that laser technology has been integrated into a certification process. This process is still in its infancy and needs more and more diamonds to go through this technique. Furthermore, diamond grading laboratories, such as the Gemological Institute of America (GIA), offer a traceability service whereby the actual rough is sent to the GIA to record data. And subsequently once that rough is cut into the final polished stone, it is sent back to the GIA to complete the data set. This information is available to the consumer in a mobile app (Android and iOS) where there are videos and photos of the stone from rough through to polished stage along with certification. The GIA have offered this service since the past two years and confirm that they are in the process of expanding the scope of this service by working with more and more industry manufacturers to submit stones to them for this traceability service. So, the old adage that – ‘consumer is king’ is very true. As the consumer expects more than just a piece of jewellery, the industry needs to evolve and adapt by finding ways to genuinely improve its responsible and ethical sourcing. Those jewellers who fail to respond risk adversely affecting their brand name and consumer loyalty. 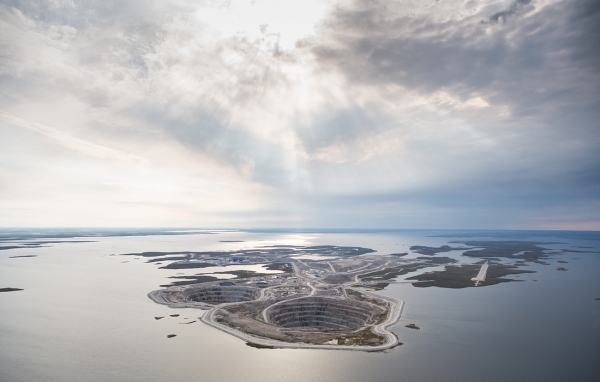 Feature image: Aerial view of the Diavik diamond mine in the remote North West region of Canada, about 200km south west of the Arctic Circle. Image courtesy: Rio Tinto. Our Mission is to create long term valued customer relationships by manufacturing quality diamond jewellery at excellent value. Contact Us to begin a journey of creating your bespoke piece of jewellery. Essential to our customer trust and relationship building process is the fact that we value your privacy. Read our privacy statement. Our website is hosted on a platform that has been designed with a maximum use, no waste of resources mindset. For every amperage that our hosting pulls from the grid, our website host invest 3 times that in the form of renewable energy via Bonneville Environmental Foundation.